The Ewok Festival of Love has ended. Allay loo ta nuv! - The Ewok Festival of Love has begun in Tyrena, Kaadara and the Southern Ewok Lake Village on Endor. Earn Ewok Chak Hearts by playing matchmaker between couples in Tyrena or Kaadara or bundling love cards in all three locations. Don't forget to keep an eye out for Kyoopid. You may also want to have a few words with the Chief. Starting today, only the first five characters created on an account with receive 110k credits. 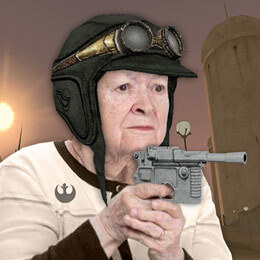 Every subsequent character created receives the SWG default value of 1100 credits. Deleting a character does not reimburse you a creation, regardless of how many characters you've made. Only the first five get 110k. If you've already made five characters, all your character from here on out will only receive 1100 credits. New items added to the Ewok Festival of Love vendor. Chak Hearts are now stackable. Some secret stuff not yet enabled. Changed Auto Registration Disabled message to indicate that the player needs to make an account. Reduced Player City Shuttling boarding distance to 36m. NPC Shuttles and Starports retain their 90m shuttle distance. Players can no longer shuttle from a Player City while inside a structure. Removed SR Coin drops from (yellow) trash Prophet Troopers on Kaas. Terentatek World Boss scales with number of players in the area. Fixed Potential int overflow in StructureMaintenanceTask.cpp event. Fixed no build zone around Dark Force Shrine (WB) on Kaas. Fixed Holoshroud reading float instead of int for charges. Fixed all radial options on Holoshroud instructions triggering the learn option. Fixed particles on Exar Kun Zapper. Disabled player cities on no build planets. Players can now craft One-Handed and Two-Handed rings. Moved NPC spawn closer to the workbench. Decreased range of workbench to 2 meters. Removed Named Color crystals from Possessed Explorers. Fuel Container can now only be accessed once every 15 minutes.